Chris and Sonja - The Sweet Seattle Life: Slips, Anyone? 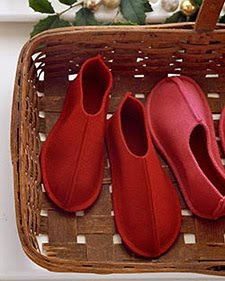 I was cruising through Martha Stewart the other day and discovered these sweet little slippers. Aha! I said to myself, finally, a sewing project that is at my skill level. I can trace a design onto felt. and cut out a pattern, no problem. I can even pin things together pretty well. They look kind of funny pinned together, but that's ok.
See? Even a row of nice straight pins. It's the sewing part I worry about. A shame, too, since I have such a beautiful sewing machine. I should really learn how to use it properly. We had a few many false starts.. But eventually I turned out a few good pairs. Just don't examine them too closely. And don't try to put them on Bailey. I already tried that. He's not a fan. Find the template for sizing your slippers here.